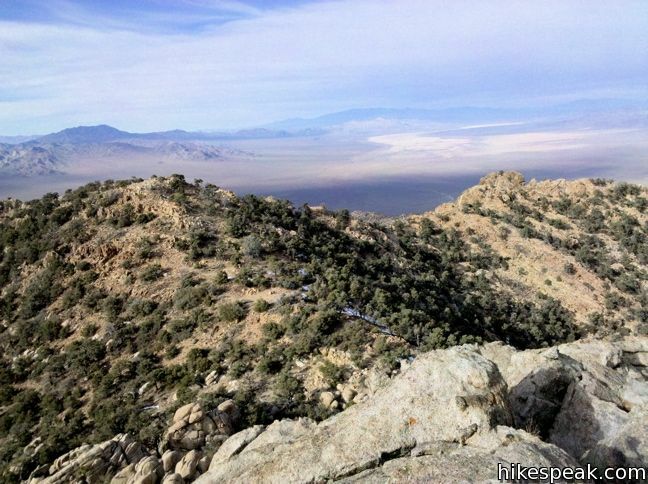 The New York Mountains are a micro-range in the northeast corner of Mojave National Preserve. 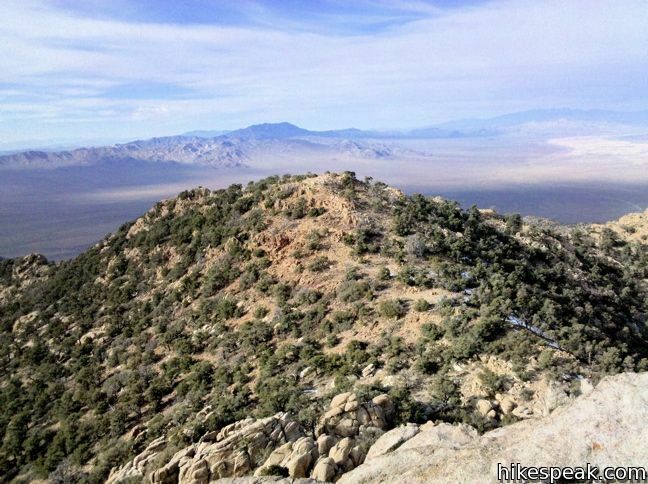 The highest peak in the range (7,533 feet) offers a sprawling desert vista, and is considerably easier to reach than other peaks in Mojave, which require slower hiking around cacti and other obstacles. Those driving a low clearance vehicle will not be able to make it all the way up the dirt road leading to the Keystone Canyon Trail. Instead, pull to the side when the road gets too rough, and continue on foot. 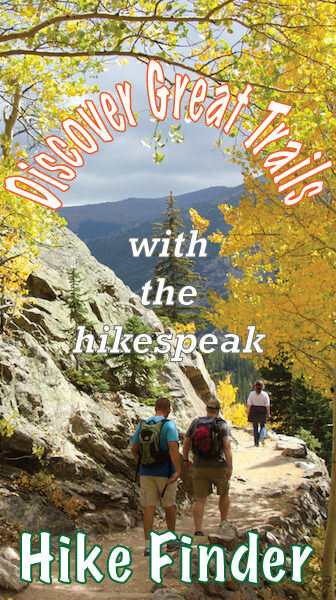 This is a 7-mile hike for those with a 4X4 and a nine miler for those who don’t. Between the road and the summit is 2,400 feet of elevation change. For those on foot, the road is hard packed and movement is easy and swift. Posts in the road mark the end of the drivable portion. Continue up the canyon past a few roadside campgrounds. 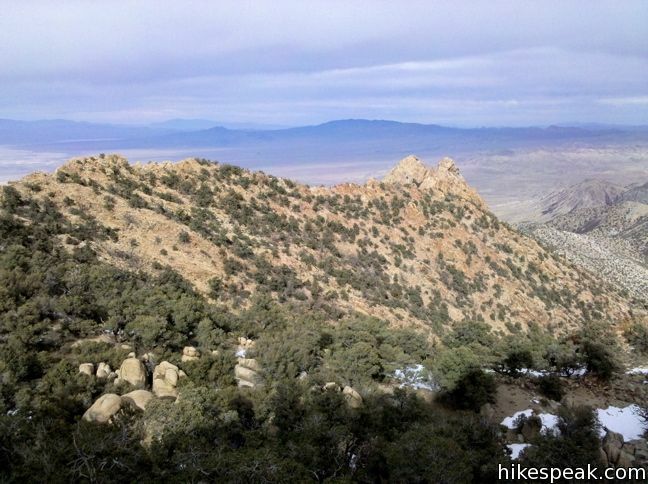 The terrain remains relatively easy to hike as the rugged road parallels and overlaps a dirt wash. Remain in the main channel and follow this deteriorating road up Keystone Canyon. Even if side-washes look appealing, remain with the main wash as this will bring you closest to the peak. At the top of the road/wash is a large soil deposit. 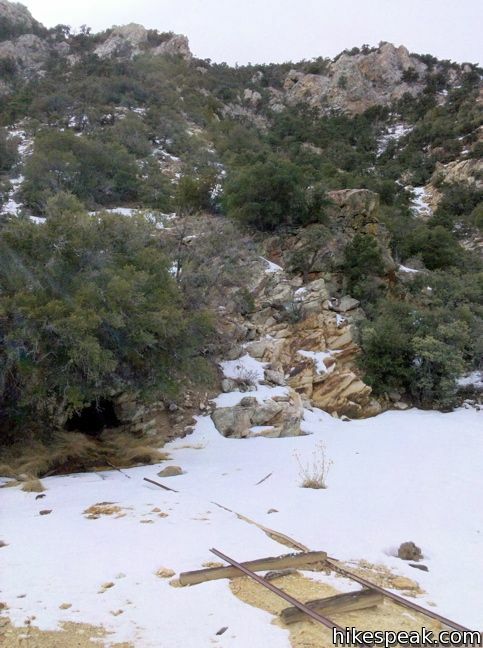 Above the deposit is an abandoned mine with a few yards of rail line leading out the entrance. It is time to leave the clear easy trail and forge uphill to the summit. Climb the step wash just behind the mine. It is rocky but clear of any dense vegetation or other impediments. 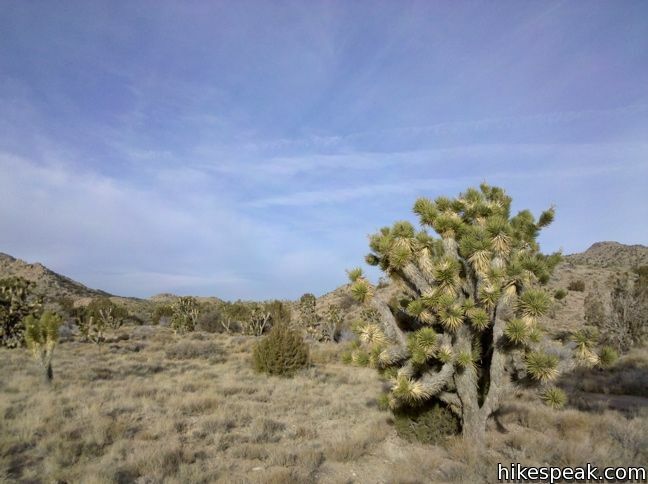 Hike your way up to the ridgeline, shifting your target to the saddle to the right of the high point in the ridge directly above the wash. Cross through the Juniper and Pinyon Pines, possibly stumbling upon a narrow footpath, which leads up to a clearing in the saddle. On the other side of the saddle, lies the peak. All that stands in the way is the top of Caruthers Canyon. Take a line across the right side of the canyon, maintaining your elevation. 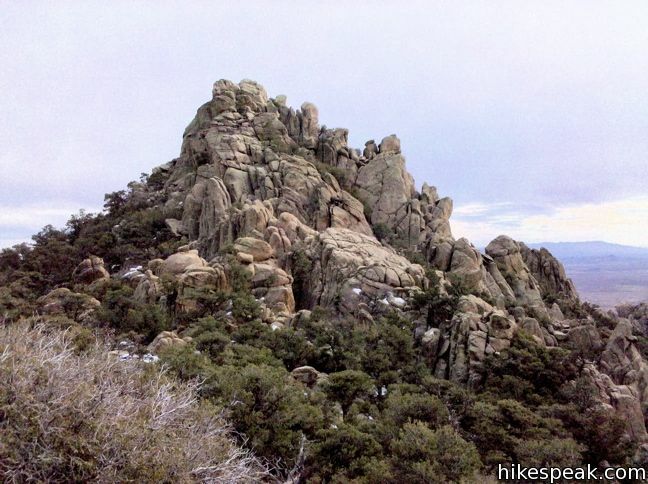 Large rocks and vegetation force a bit of meandering, but the terrain remains good for hiking. 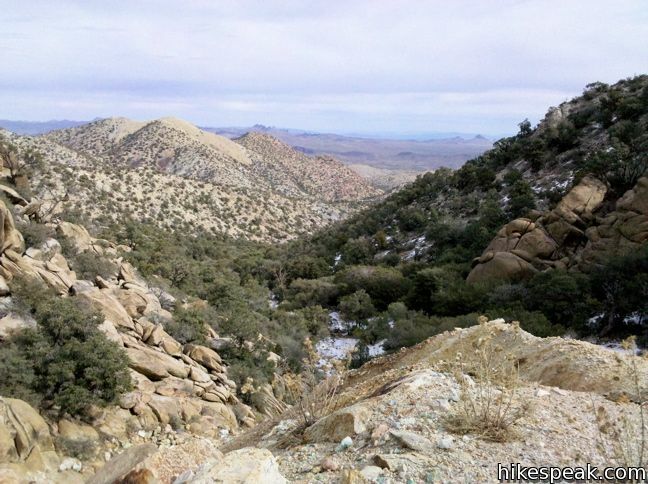 Climb to the ridgeline at the top of Caruthers Canyon where sweeping views await. Look down the other side of the ridge toward the Clark Mountains and the 15 freeway. Turn left toward the round summit of New York One. Beyond and to the left, the rocky Pinnacle of New York Two, the range’s highest point, should attract your attention. The views from the top are indeed panoramic and worthy of the class 3 climb required to reach the register. The west side seemed to provide the easiest access. Once atop the great rock, have a look down on Pinto Valley and the southern end of the New York Range, a mesmerizing collection of steeple-like rock formations. After soaking in the view, return the way you came. 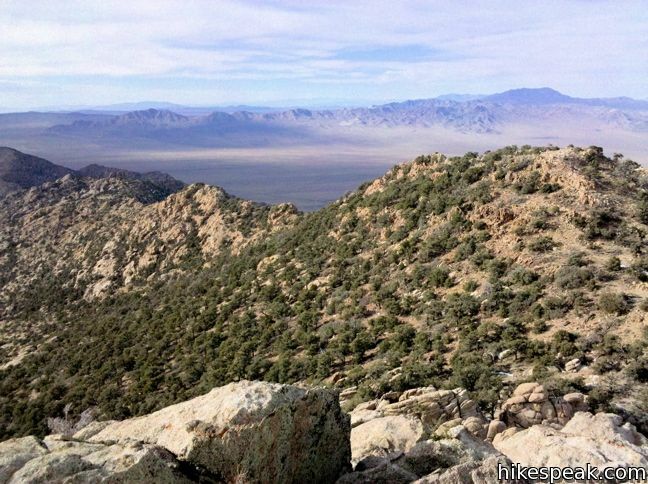 No fee or permit is required to hike to New York Peak in Mojave National Preserve, so get out and enjoy. To get to the trailhead: From the 15 freeway, exit on Nipton Road. 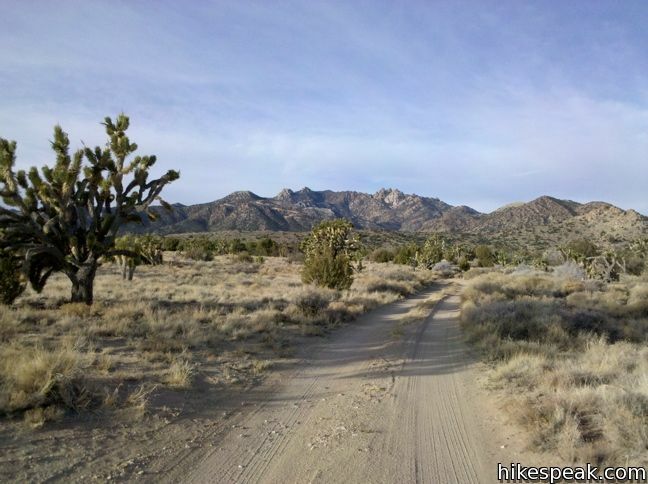 Turn right on to Ivanpah Road and head south for 18 miles. Turn right on an unmarked dirt road. Bear left at the V. Those driving low clearance vehicles should find a place to park when the road gets to tough. At the next fork in the road, turn right down the marked road toward Keystone Canyon. The 4X4 parking is at the end of the road. 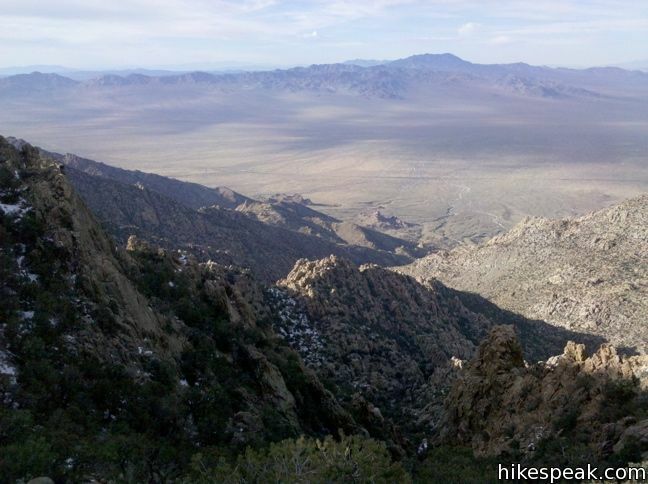 This 3.4 to 4-mile round trip hike crosses the world's densest Joshua tree forest, passing an abandoned silver mine to reach a rocky summit with views of Cima Dome. 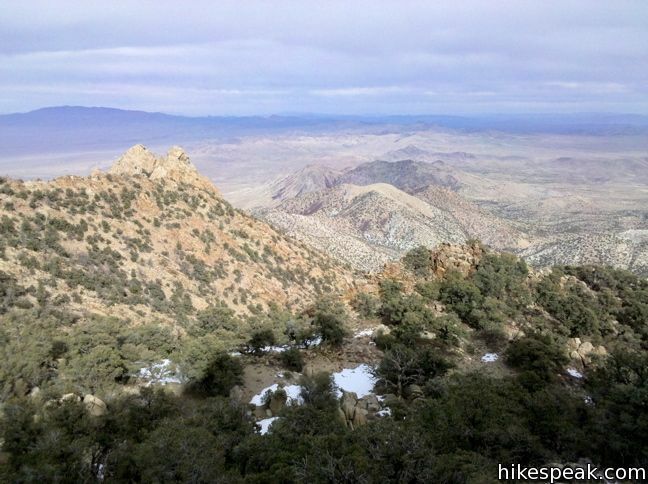 This 1 1/3-mile loop visits a rare desert spring, a Rock House built in the 1920s, a miners' mill site, and an old U.S. Army post on a short and scenic circuit. 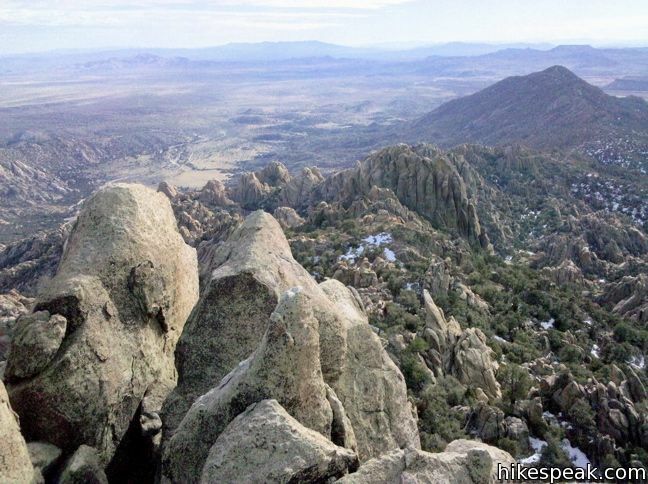 This 1.5-mile loop takes visitors through a landscape of pocketed rocks. Ringbolts allow fun passage through narrow canyons. This short 0.6-mile hike drops below the surface into an old lava tube. 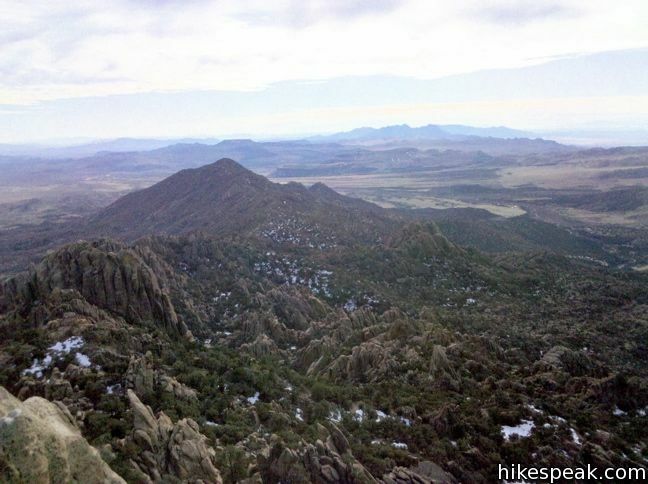 This 8.5-mile hike summits a 6,365-foot peak in the Granite Mountains. 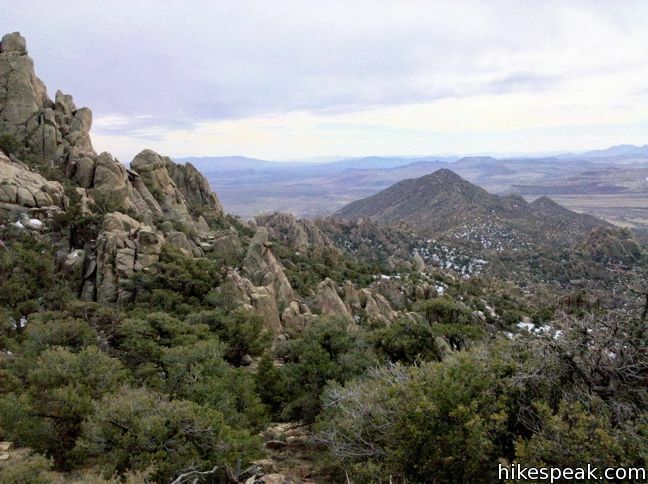 This 5-mile off trail trek summits a peak with commanding views over the Providence Mountains. This 3-mile round trip hike climbs 470 feet to the highest point in this 45 square mile dune field. 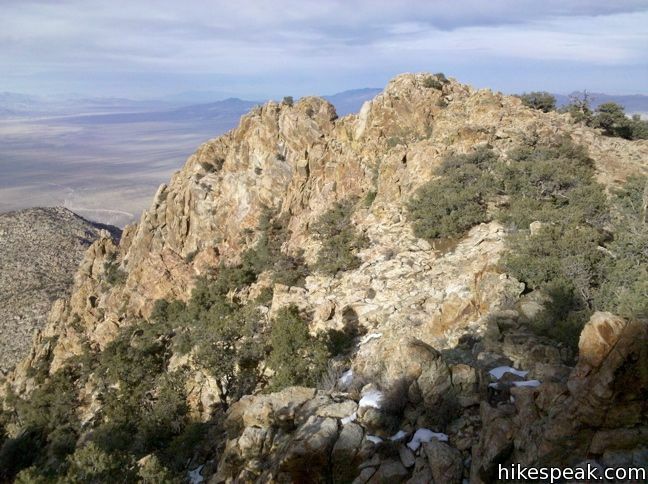 This 3-mile round trip hike travels up and into this crater adjacent to Mojave National Preserve. There are a few campgrounds and endless roadside camping within the preserve. My experiance in this area was an important part of my life, my parents & granparents (Alexander) lived in this area for many years & I spent a great deal of time working at the abandoned mine (the Dorr Mine) you referred to. 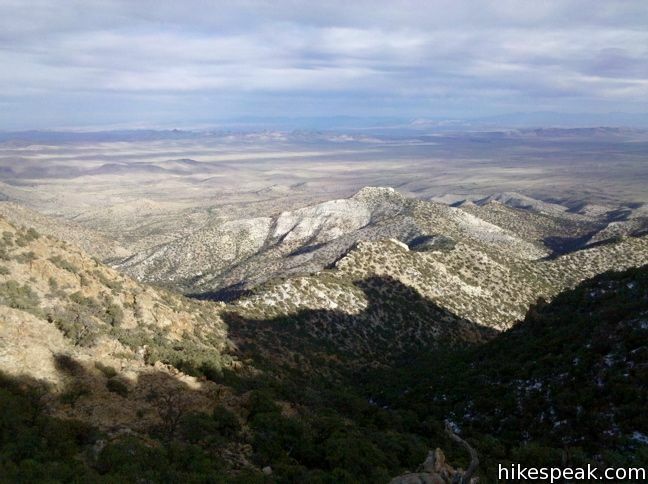 Why did you choose to explore the summit from Caruthers rather than driving to the old mine road from Pinto Valley and then hiking to the summit on the old mine road (approx. 2 miles) & then to the summit? I climbed to the top of that peak when I was 12 years old, my father had built a monument of rock & left all who climbed there, our names in an old tobacco box inside the monument, I guess overtime it was destroyed by others. I am 73 at this time & one of the few Dorr’s & Alexander’s left to record the history of the E. Mojave & it’s homesteaders. My dad left the area in the 50’s but we continued visits through the years, I was last there in 1978.